Had a really good dinner of hummus and various salads in Fureidis the other day with Lior. Pretty good reward for us hiking close to 20 kilometers across the Carmel in just the afternoon. So...while roasting the eggplant I whipped together a tahina based, wasabi sauce and the result was really tasty. Try it out and let know what you think about this Israeli/Japanese fusion-ish of dish. 1. Roast the eggplants on a gas burner until skin is charred and the inside is cooked and soft. 3 minutes per side should be enough. Once done, put in a bowl and cover with a towel to keep in steam. Once cook, scrape off charred skin and place the flesh in a mixing bowl. 2. Mix tahina paste, soy sauce, wasabi, oil and pepper until mixed well and smooth. Add to eggplant and fold in well. 3. Add chopped cilantro and serve with bread, pita or on its own. Can be served warm or cold. So, the past 24 hours was Israel's annual No Car Day, sometimes referred by certain strange individuals as Yom Kippur. 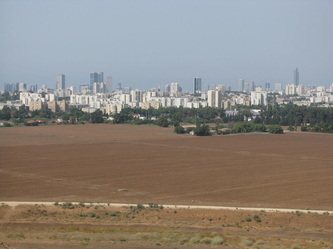 I did a great bike ride today on much of Tel Aviv and Gush Dan's main highways (greater Tel Aviv metro area), which led me to the Hiria. 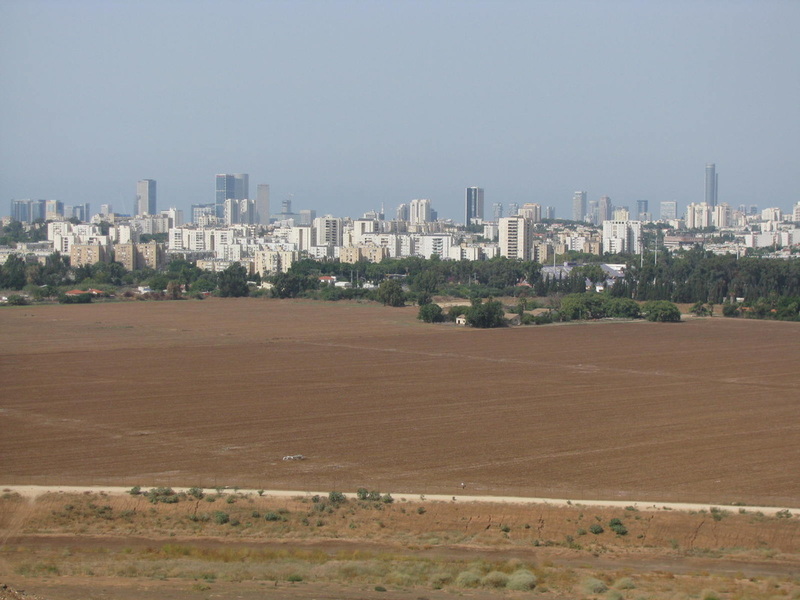 Anyone that's been to Israel knows the Hiria as the massive garbage dump on the outskirts of the city that rises above the surrounding area. In the past few years the Hiria has been turned into an ecological park and is a pretty cool example of being able to reclaim these kind of areas as green spaces. Its not entirely finished yet, but I was riding by on Highway 4 and decided to go to the top and see what its like. 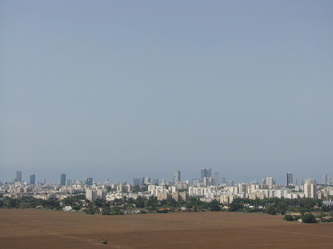 (There was no around today to tell me not to go up) The view from the top is incredible, with easily the best view of Tel Aviv I've ever seen (see pictures below). In addition, I saw some sage growing, picked some and thought I'd add it to a great taboule recipe I know. We can call my sage from the Hiria version, Garbage Dump Taboule. Just kidding....kind of. 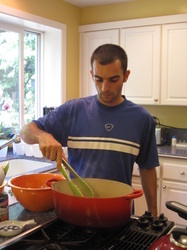 The taboule recipe I use is that of Liz Steinberg's, and she published a post about it on her blog Cafe Liz. Please visit her blog to see the recipe. I made the taboule a few months ago, and I thought it was delicious; easily the best taboule I'd had, and Liz gets all the credit. Liz liked the Taboule, but didn't think I used enough parsley. As she puts it, "Taboule is a parsley dish" with other stuff added to it. I followed her proportions exactly, but I could have bought some bunches of parsley that were not as big as she's used to purchasing. So...if you make this recipe, follow Liz's advice and buy BIG bunches of parsley. At Israel Food Tours we want to wish everyone a wonderful new year full of happiness and great food. Chag Sameach and Shana Tova! If you've been reading the last few blog posts, you know that I was in Portland in July for a quick visit after a many year absence. A few weeks before I left my childhood friend Miriam and her husband Nick were visiting Israel, and they gave me great restaurant recommendations for my upcoming Portland visit. They highly recommended Kenny and Zuke's, a deli, and Le Pigeon, one of the most acclaimed new restaurants in the city. 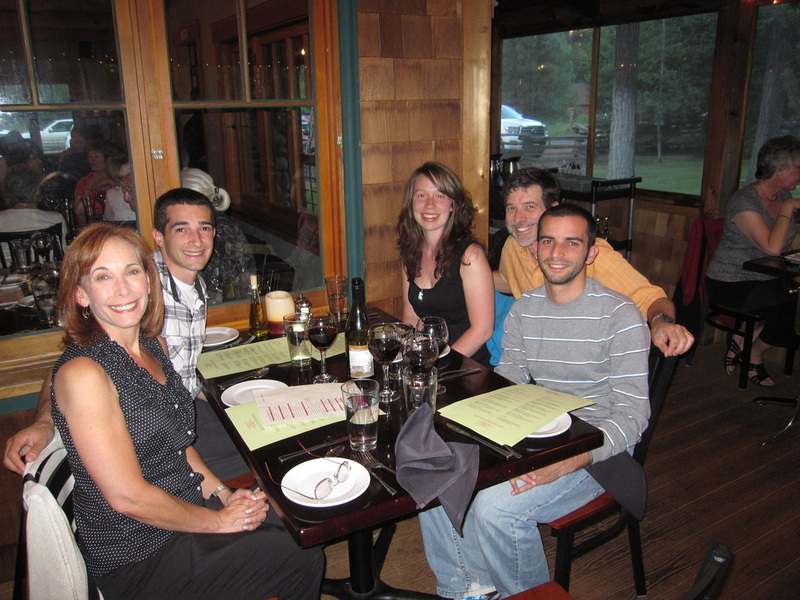 These restaurants are just some of the many fantastic dining establishments Portland has to offer. Portland is kind of trendy these days as a food (and everything else) destination, but the truth is the city has always had great food. It just took the rest of the country a long time to take notice. I think native Portlanders prefer it that way. While Portland's food scene has always been great overall, it never had a great deli, aI'm kind of pissed off something like Kenny and Zuke's (KZs) did not exist in Portland when I was growing up there. In any case Portland now has its great deli. KZs makes their own pastrami (ridiculously good), breads (also ridiculously good), pickles (also also ridiculously good) and has created a deli as good as anywhere I've eaten. Granted I have not eaten at all of the best NY and Montreal delis, but I imagine KZs can hold its own against any of them. I had the P.L.T. 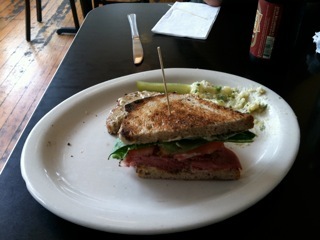 (Pastrami, Lettuce, Tomato) on Rye, and it was ridiculously good (not sure changing the adverb and adjective just for variety would express myself any better). Oh, I had a cream soda too, which might have been my first one in some 6-7+ years. 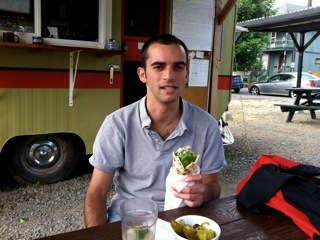 Before going to Le Pigeon, my mom mentioned that Portland now has a sabich food cart. Portland had a strong food cart scene years before it became a national trend. During high school I would go get lunch at one of the various bento or burrito stands near school. 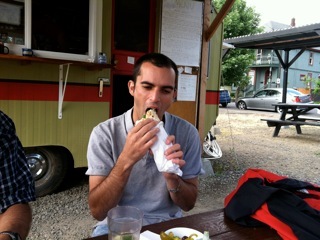 Hearing that there was sabich in Portland, I had to go there. 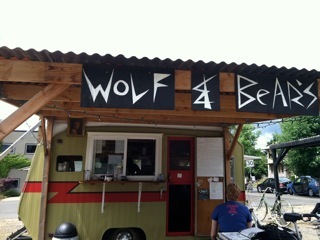 Wolf and Bear's serves sabich, falafel and other Israeli/Middle Eastern dishes. While their version of sabich is presented a bit different than what I'm used to here, it is very good. Served in a lafa, with more lettuce and less amba, it has its own unique style and flavor. I might have gone for a bit more amba, but I was very impressed with Portland's take on sabich. Finally, Le Pigeon. It was the most interesting dining experience I have had in years. Gabriel Rucker, Le Pigeon's chef, just won the James Beard Award as the top rising chef in the U.S., and you can see why. I'm only going to discuss the appetizer I had, but please be assured that every other dish myself, my parents and my brother had were just as amazing and creative too. 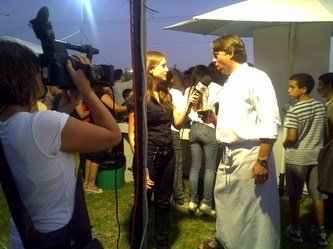 I am not also not a talented enough writer to fully convey the dishes and how good they tasted. This was some damn good food! I ordered the pigeon crudo appetizer, which presents pigeon served two ways. One is the leg fried (toes and all), and while some people may not like seeing the entire leg, it is soooo good. The more creative of the preparations was the second, which consisted of essentially pigeon carpaccio. The pigeon was cooked sous vide ever so slightly so that it is not 100% raw, but very, very rare. The pigeon had a very unique, complex flavor with touches of citrus. This is probably the most creative dish I have ever had. The other thing I want to mention is the pure genius that goes into their preparation of vegetables. They vacuum pack their vegetables in wine for a day before they cook them, and it blew my mind. I've never had better tasting veggies and the attention to detail really shows through. 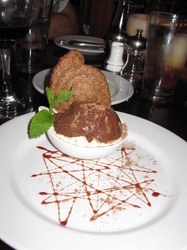 You can view pictures of their dishes at the following fan blog. A few months ago I came across a great recipe in the NY Times for turkey necks. I love!!!! 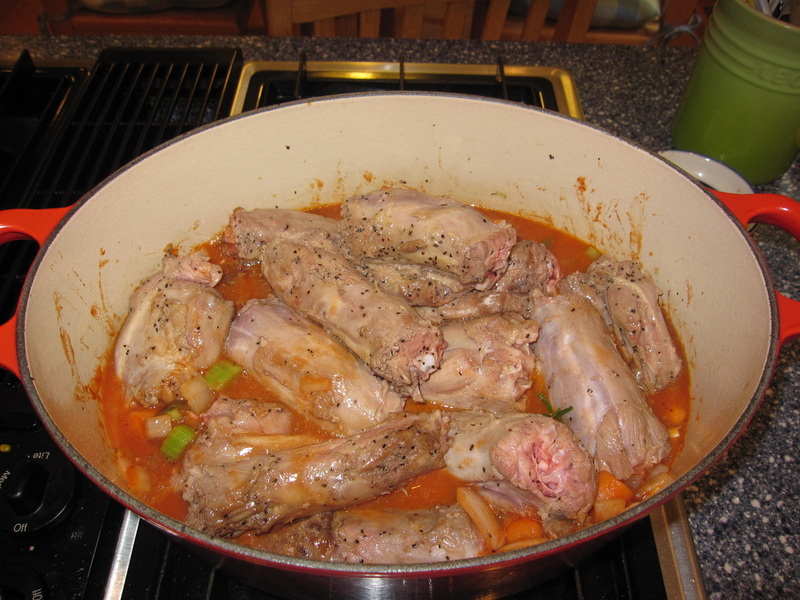 turkey necks, and unfortunately so many people throw them away when preparing their turkey. The neck is one of the tastiest parts of the bird and can be eaten on its own, in a soup, or is a great base for a stock. One of the workshops Israel Food Tours offers is a Yemenite cooking evening, and turkey neck soup is the star of the meal. 1. Heat the oven to 325 degrees. Season the necks with 1 teaspoon each salt and pepper. 2. 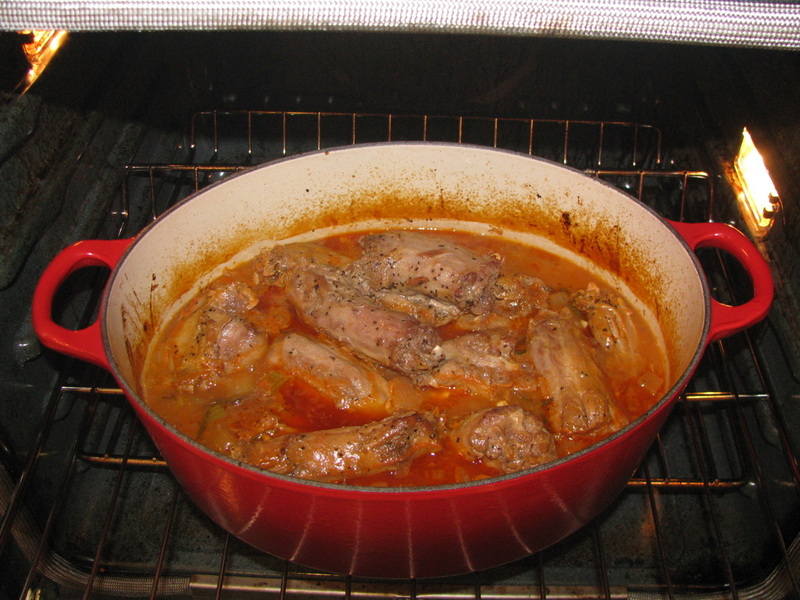 Heat the oil in a large skillet or Dutch oven over medium-high heat. 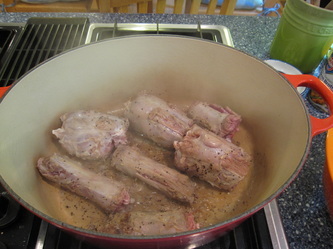 Cook the necks, turning occasionally, until dark golden, about 10 minutes, then transfer to a plate. 3. Add the carrots, celery, onion and 4 of the garlic cloves to the skillet. Cook until the vegetables are soft and golden, about 5 minutes. Season with 1/4 teaspoon each salt and pepper. Stir in the tomato paste and cook until darkened, 1 to 2 minutes. Pour in the wine and simmer, scraping up any browned bits at the bottom of the skillet, 2 minutes. 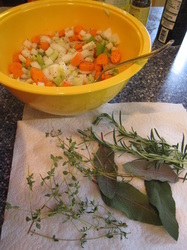 Add the broth, rosemary, sage and thyme (tie herbs together with kitchen twine if desired). Return necks to the pot. Bring liquid to a simmer. Cover pot and place in the oven. Cook, turning necks occasionally, until they are very tender, 2 hours. 4. When the turkey necks are done, transfer to a serving platter. Bring the liquid in the pan to a boil over medium-high heat; simmer until thickened, 5 to 10 minutes. Pour the sauce over the necks. Combine the remaining garlic, parsley and lemon zest in a small bowl; sprinkle over the turkey. An alternate preparation could be to put a few turkey necks, garlic and vegetables (once prepared as described above) into an aluminum pouch. Put the pouches in an oven pan, place in the oven and cook for 2 hours. Each person will get their own individual portion this way. 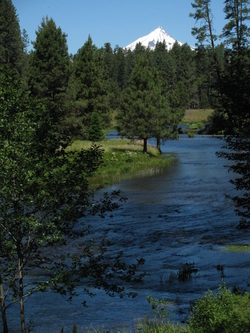 Many summers, while growing up in Portland, my family would go to Black Butte in Central Oregon for a week. Central Oregon in the summer, with temperatures in the high 80's, green everywhere, view of five mountains, hiking/biking/swimming, is basically the most perfect place on this planet. One of the traditions that made each visit special was our dinner at Kokanee Cafe in Camp Sherman. 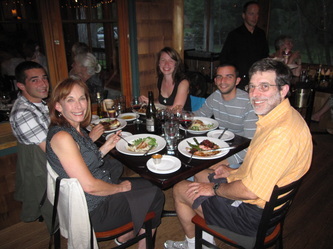 My family likes the restaurant so much we once drove there from Portland (a 3.5 hour drive each way) for Father's Day dinner and headed back to Portland right afterwards. 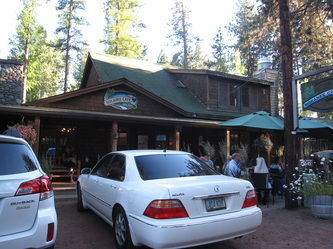 I was just in Oregon for a short visit, and after a 10+year absence I went back to Black Butte and Kokanee Cafe. 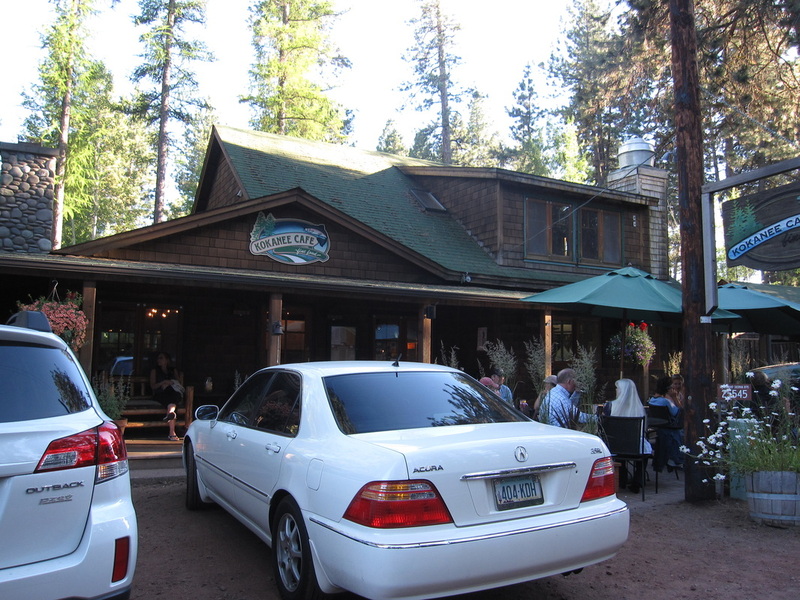 Camp Sherman is a really small town on the banks of the Metolius River, and Kokanee Cafe is small unassuming place that very much fits in to Camp Sherman. What's not unassuming about the restaurant is the awesome food they make. Growing up I would always get their quail dish, which I can vividly remember the taste of to this day. 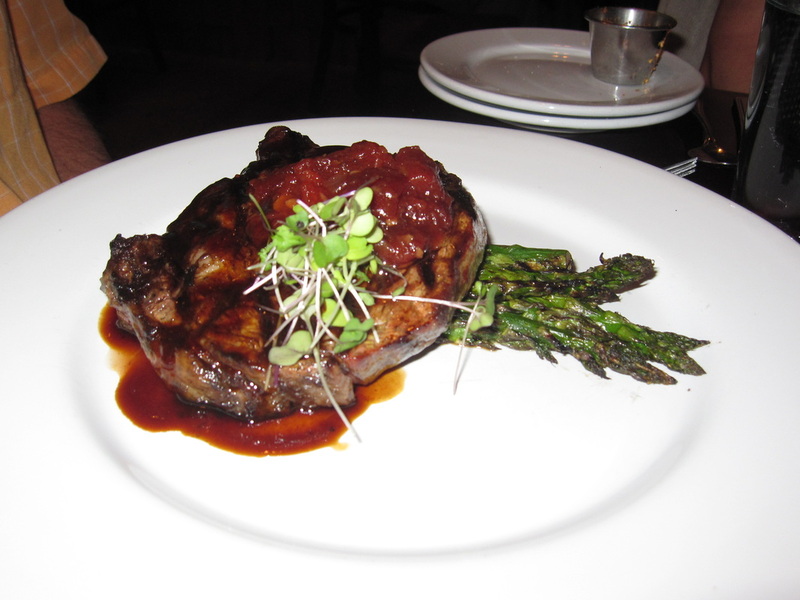 While they no longer offer this dish on the menu, they still make some great food. 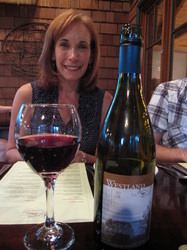 Our dinner on this occasion started with a really nice Pinot Noir from Westland Vineyard, an Oregon winery. 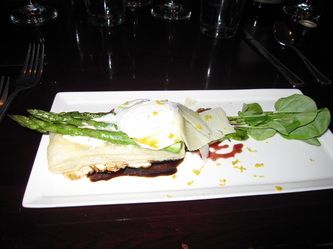 My first course (and probably my favorite dish of the night) was an asparagus dish presented on top of a phyllo dough pastry, topped off with a poached egg and cheese that is a cousin to parmesan. Our main dishes were all excellent. 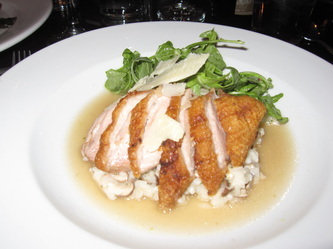 I had a duck with mushroom risotto and a lemon broth. 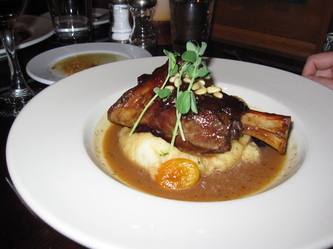 We also ordered some delicious lamb shanks and ribeye steak as well. 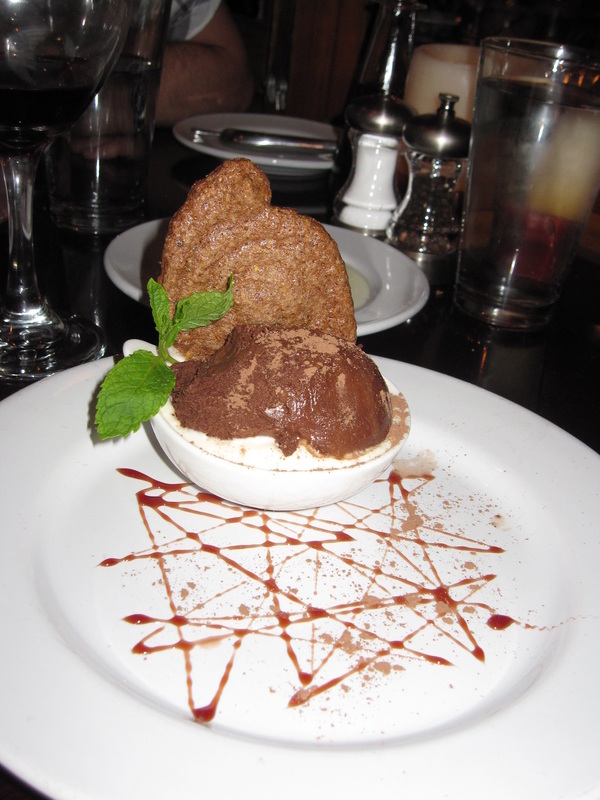 My brother and his girlfriend Brit split chocolate mousse and creme brulee for desert. 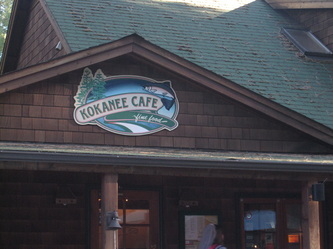 After such a long break I had very high expectations and Kokanee Cafe came through again as it always has. 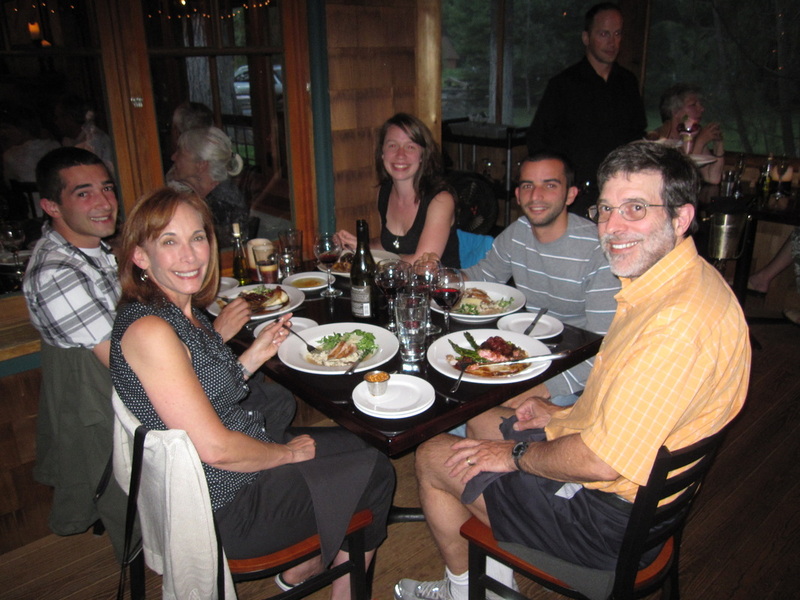 With a simple yet elegant atmosphere, a stunning location and a great locally sourced food, Kokanne Cafe really is the perfect restaurant. I just hope that my next visit comes sooner than ten years from now. This week I was thrilled to receive an invitation to the Inbal Hotel for a private tasting of Sofia Restaurant’s completely revamped menu, created by new executive chef Moti Buchbut. Having little idea of what to expect, I put on one of my foodie girl-about-town outfits and set out excitedly. Once there I met up with three of the hotel’s executives and four other food & culture bloggers, and we were led to a beautifully set round table with a view of the hotel’s gardens, where the bright flowers lent a pleasing accent to the subdued gray, silver and natural wood tones of the room. No detail is accidental in this five star establishment -- everything from the napkins to the floral arrangements indicates someone (or a team of someones) with a fine eye for cohesion and atmosphere has been there first. Chef Moti, who looks exactly as you would expect -- a classically Sephardi-Israeli with a sweet smile but a manner that is all business -- greeted the table and explained that today’s tasting would be a demonstration of how the new menu was “still Italian but more right-now.” The first example was the homemade brioche with three different tapenades, in which the combination of sweet and savory was meant to arouse the appetite before the meal. The enormous brioche were unexpectedly light, just sweet enough, and went very well with all three spreads: black olive, green olive, and red pepper. Although I had needed little convincing, I could tell we were in capable hands. The first course, Chef explained, was a smoked eggplant melanzana with roasted peppers, pesto, and mozzarella, wrapped in baked filo and served with a wine cream sauce, a balsamic reduction, and a fillet of tomatoes with Atlantic sea salt. The ingredients worked extremely well together, the filo’s crispness juxtaposing the eggplant’s texture very nicely and the sea salt was a great touch. The balsamic reduction got lost in the sauce, however, while the mozzarella was a bit too prevalent, making it a heavier first course than I would have preferred. The next course was the star of the menu: a tuna ceviche that was so beautiful it looked as though it had been arranged by a florist. 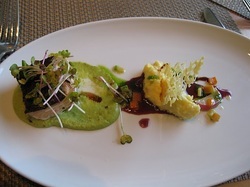 Iridescent tuna dotted the plate along with radish, jewel-colored beets, sunflower sprouts, and fresh citrus. This dish tasted like summer and was accentuated with sea salt crystals and notes of white wine. All the things I love about food were present here, the use of local produce, simple preparation, flavors that are familiar yet surprising when combined, each ingredient distinct but complementary to the whole.... If I were to come back to Sofia, this would be my order. After the ceviche came a couple of rather forgettable courses, which isn’t to say they were not tasty, just un-special. The first was a baked mushroom plate. Attractive, but unexciting, the mushrooms were filled with cheese and fresh herbs, each atop a bed of Swiss chard -- which, I will say, was cooked to bright green perfection. The next was a cream of broccoli soup with mushrooms and garlic crostini which, as another blogger pointed out, was something easily made at home. The presentation, though, did win my heart: it was served in a white mug and topped with a dollop of steamed milk, and anything reminiscent of a cup of coffee is a winner with me. The next dish was unforgettable, but not in the same way as the ceviche. Chef described it as a fatoush salad with fresh herbs, lox, grissini and smoked mozzarella, topped with a dollop of cream and kalamata olives. Unfortunately, lox and smoked mozzarella are not my favorite flavors, but I could see this being a good feature on the restaurant’s brunch menu, if the salad had a little more zip -- maybe more pepper or lemon -- and the grissini were thinner and crispier, less like old fashioned bread-sticks. Also, the presentation, with the mozzarella wrapped around the over-sized grissini, felt a bit tacky compared with the elegance of the other courses. Overall, the general consensus at the table was that this salad was not on the same level as the food we’d seen thus far. The next course (if you can believe the food was still coming), was linguine made by hand in-house, with a creamy herb sauce, snow peas and magda squash. 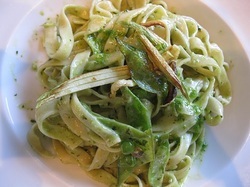 The pasta had a great texture, just thick enough, and the sauce was not too heavy, allowing the flavors of the herbs to come through noticeably. 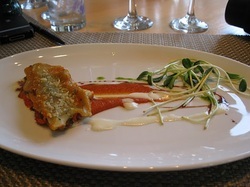 I loved this dish, a great one to share with your dining companion along with a glass of crisp white wine. Although pasta on top of pasta seemed a a little redundant, I was also happy to taste the canalone with spinach, Roquefort, mozzarella, bulgarian and french cheeses, served with coulis of red pepper and tomato, a bit of cream, and a small sunflower sprout salad. This plate was another example of the chef’s attention to elegance of composition, and when the hotel manager revealed that Chef Moti had first trained as a pastry chef it was evident that he had brought his pastry-eye for beauty and color to his plating style. Sadly, it was time for me to leave as the tuna course was served, but I did manage to get a glimpse of a healthy portion of red tuna beside a delicate parmesan crisp. I understand there was a salmon dish as well and, though I don’t think I could have manged it, I was a little sad to miss out on dessert. From what I heard meringue, passion fruit, and berry coulis were involved...and that it was all quite delicious. 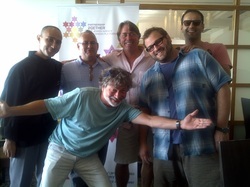 Thank you to the Inbal Hotel and to Chef Moti Buchbut. Your new menu is certainly recommendable, sophisticated, and does our beautiful city justice as a culinary hot spot. For more information and bookings, Inbal Hotel. "Every man needs to know how to make a roux. Every girl asks her guy if he can make a roux and only then will she accept him as her boyfriend. So now I have 4 boys and you can be sure they are making some fine roux!" 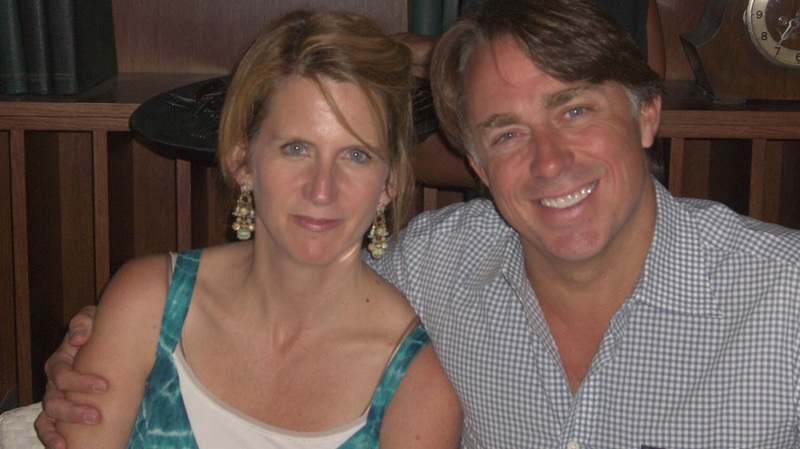 The southern charm that oozes out of Chef John Besh was widely appreciate on his recent visit to Israel. Although he worked his way through a week of cooking in steamy Kosher kitchens, I couldn't help but notice that his blue eyes remained wide-eyed and cool, constantly engaged with the people and scene around him. His presence left a strong impression in the Rosh Ha'ayin and Israeli community, and we were lucky that he also left behind his Kosher Creole Jambalaya. Why did you choose Gumbo and Jambalaya as the dishes to cook in Israel? I wanted to share the New Orleans style one-pot country cooking with the people of Israel. The majority of creole cooking stems from these two dishes - they serve as the basis for creole cuisine. I have learned that the one-pot cooking is common in many ethnic cuisines in Israel, so it is nice that we could share this. 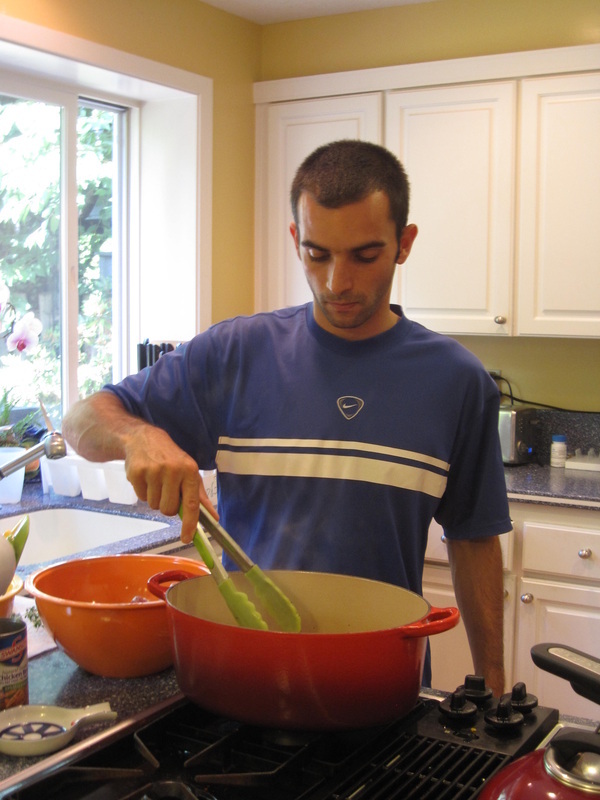 The New Orleans Jewish community has adapted creole cuisine to meet Kosher laws, and I have made replacements in my dishes to suit this community; some of this I brought with me to Israel. Besides the one-pot cooking, do you notice other similarities in Israeli and New Orleans cuisine? Yes, quite a few similarities. Because we are a port city - just like Tel Aviv - many cultures come together from all over the world. Each culture leaves their piece in the cuisine, like a base of our cooking is the Spanish sofrito and paprika. Gumbo comes from an African influence. Our food has a reputation for being spicy, and that is not necessarily the case, we just really believe in seasoning our food, which is true in the food here from what I can taste. Also, there is also a lot of abundance in NOLA, just as there seems to be here. We are approximately the same latitude, but in our neck of the woods it rains all the time. The fields are very fruitful all year with okra, peppers, collard, mustard and other greens. Our Creole tomatoes are the most delicious in the world. I love the way Israelis use tomatoes in many of the dishes. What is the best part about being a chef? The common bond you get to share with those around you. Recently I had the chance to work with the Make-a-Wish Foundation. An 11 year-old girl came all the way to New Orleans from Wisconsin because she wanted to cook with me in my restaurant. That was such a powerful experience. It was really more rewarding than any other visit from a “famous person” combined. Each of us has been given a great talent and it is such a pleasure for me to be able to use my talent to make people happy. It is ideal to spend my days this way. Where else would you like to visit in Israel? I would love to spend a little more time everywhere, in particular Eilat, the Galilee and Haifa areas. 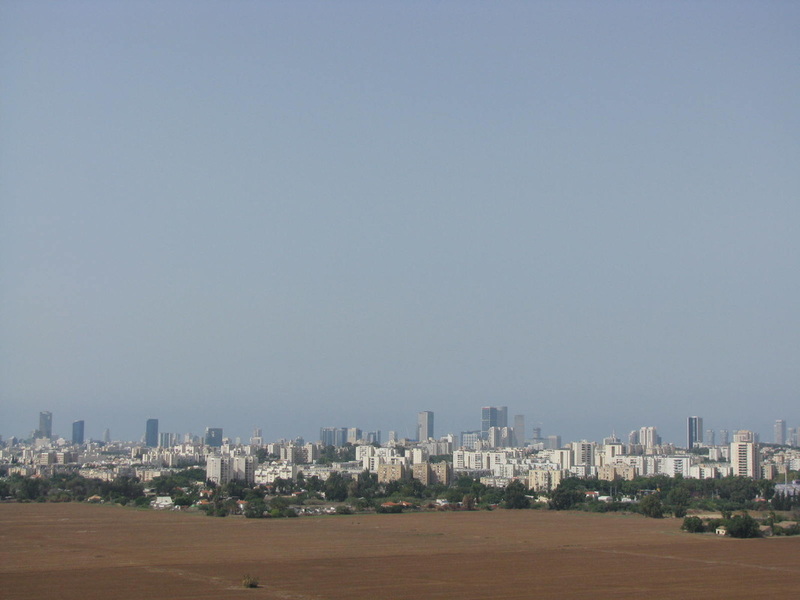 What has been the most rewarding experience in Israel? 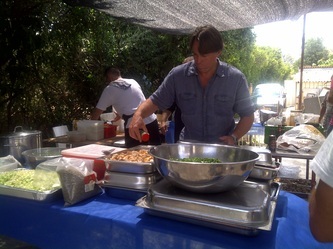 Getting to cook for the Israel Defense Force soldiers. I am not sure whether it is the same in this country, but attention to our soldiers is often left to the side, and it will be rewarding to give them the attention (and good food) they deserve for their hard work. Have you had any new food experiences here? I have spent a significant amount of time in the Mediterranean, so the flavors are familiar to me. I did experience combinations of flavors, like Moroccan Harissa using pepper and olive oils, that were done is such a simple way that it tasted like a fresh experience. The combination of Za’atar, sumac, olive oil and garlic is done passionately here and really creates rich flavor in the foods. 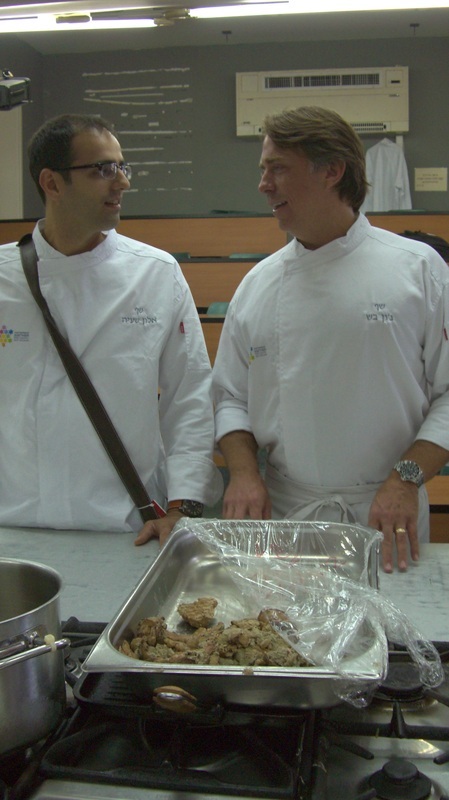 What would you like to cook for an Israeli politician? Well, I did get to cook for Ehud Barak when he was in New Orleans. He ate at Domenica and he was pretty excited that Chef Alon is Israeli also. Heat a cast iron pot and start rendering the sausage in the olive oil, while stirring slowly over medium heat. While the sausage is rendering, go ahead and season the chicken thighs with salt and black pepper. Add the chicken to the pot and continue to stir intermittently. Cook the chicken until it becomes golden brown in color. After the chicken has browned add the onions to the pot and allow them to brown as well, prior to adding the bell peppers, garlic and celery. Be sure to continue stiring from time to time in an effort that will ensure everything in the pot cooks evenly. Next add the rice and remaining dry ingredients to the pot while stiring frequently for the next 3 minutes. 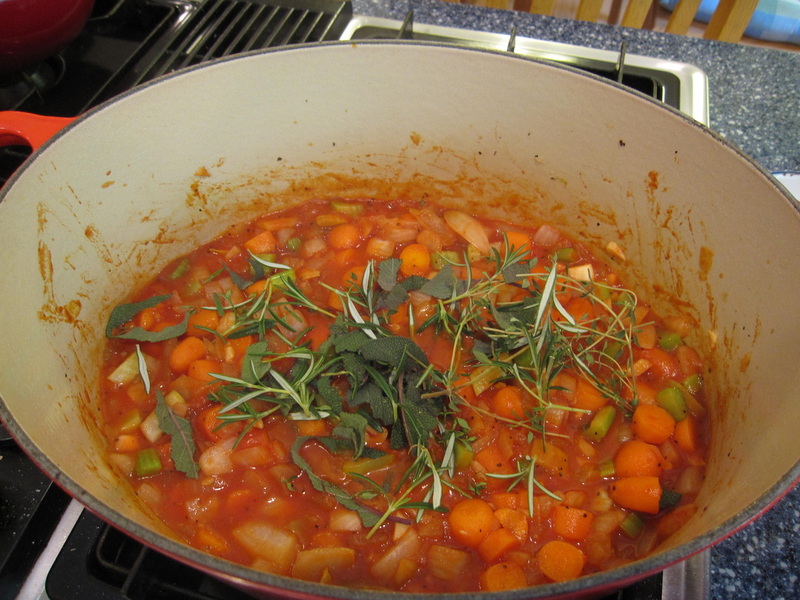 Raise the heat to high once again and add the tomatoes and chicken stock to the pot. Bring the liquid to a boil before reducing the heat to medium/low and covering the pot for 15 minutes. After the rice has simmered for 15 minutes go ahead, remove the lid from the pot and fold in the green onions. Turn the heat off and cover the pot again for an additional 10 minutes.